Your Personal Key Infrastructure up and running in 10 minutes. 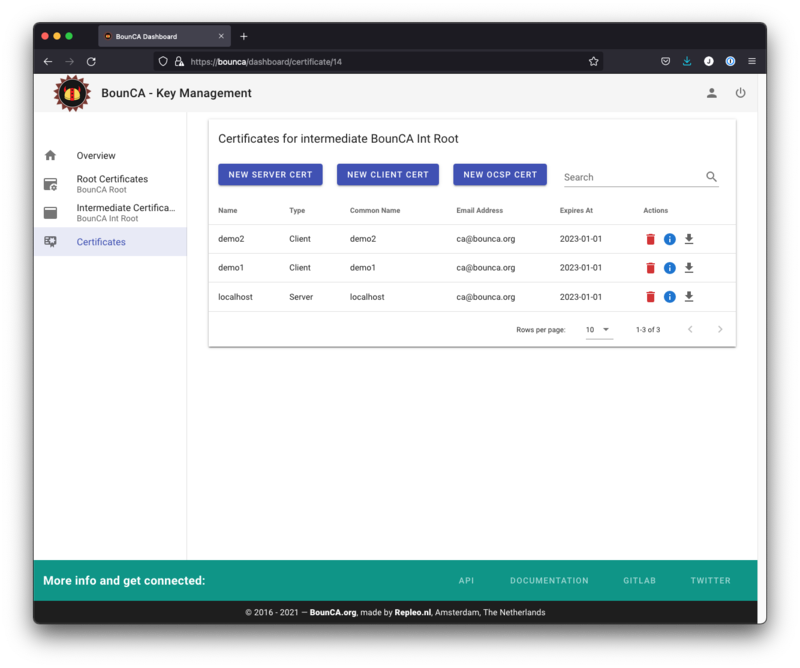 BounCA makes interacting with OpenSSL easy and let you setup a trusted encrypted communication network with your peers in a couple of minutes. 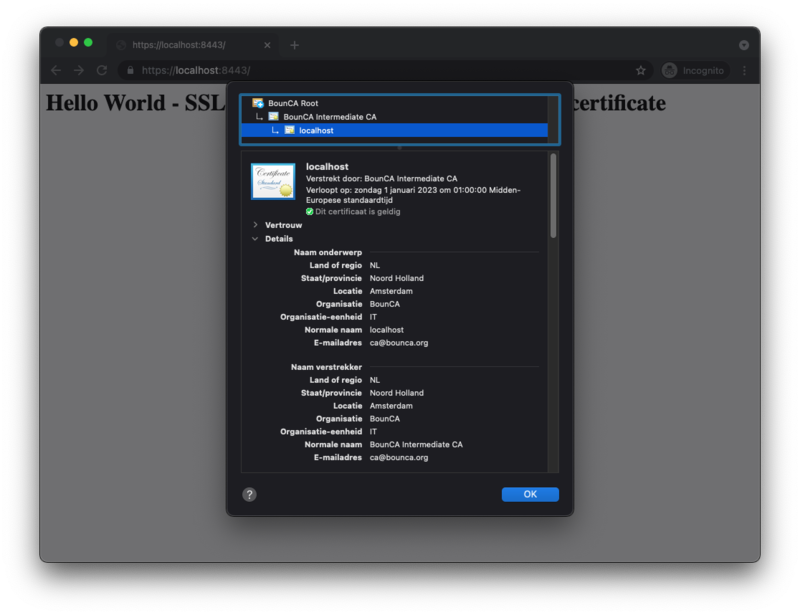 Create a PKI, sign and revoke server and client X.509 v3 SSL certificates. 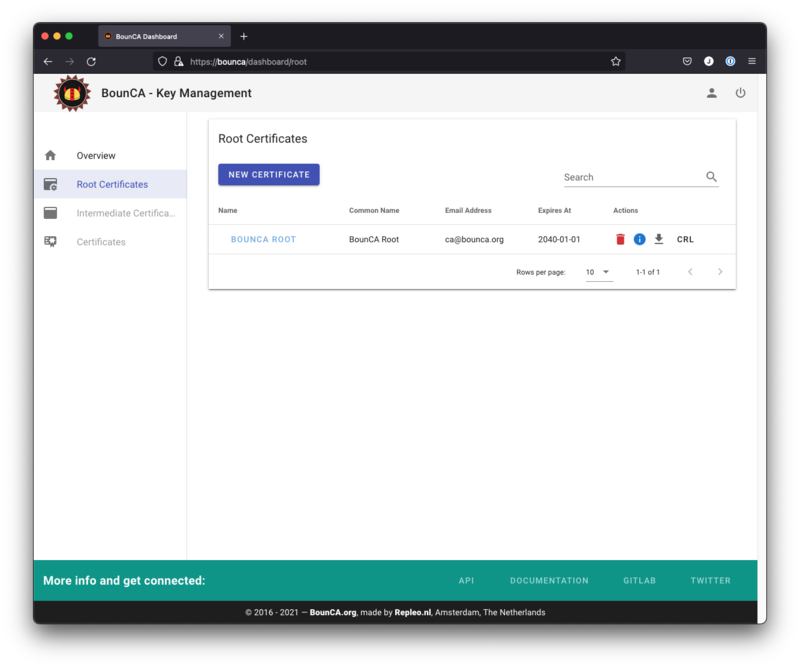 With BounCA you can secure your web applications and OpenVPN connections without passwords, and secure access to your private cloud services with own HTTPS scheme. With BounCA setting up a provisioning service for your Internet of Things devices was never so easy. BounCA lets you create root certificate authorities, create intermediate certificates and client, server certificates in an easy web application. Export your keys as PEMs, PKCS12 files for your mail clients, and web servers such as NGINX and Apache. 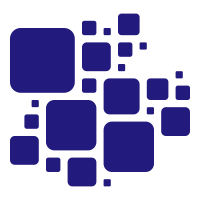 BounCA is a web based tool. 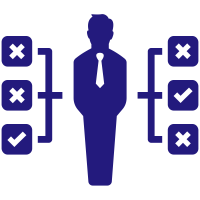 Within your favourite browser, you will have a clear overview of outstanding certificates, and the ability to revoke them within one mouse click. Keep also track of the expiration of certificates by importing the expiry date in your calendar. 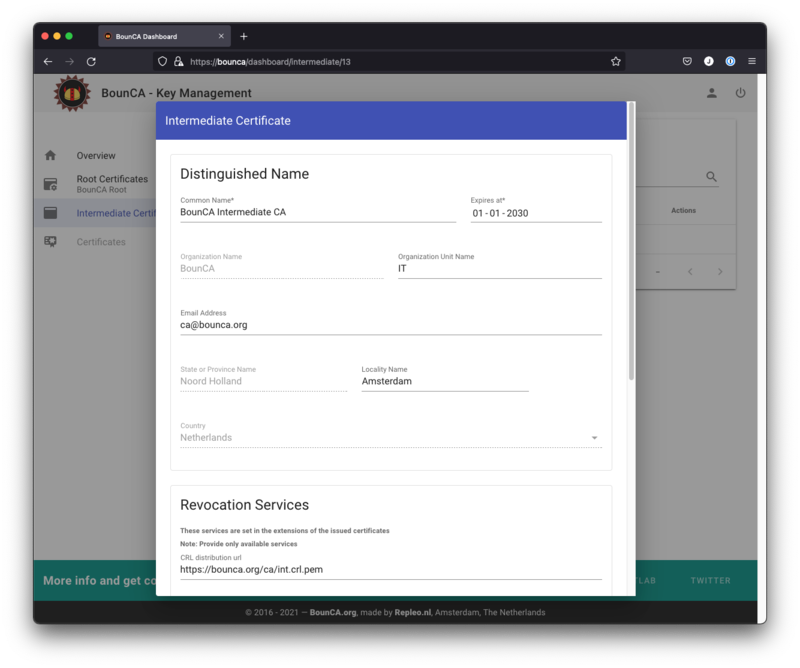 With BounCA, you can access your CA via a web browser, RESTful API and it is also possible to export your PKI with command line scripts. 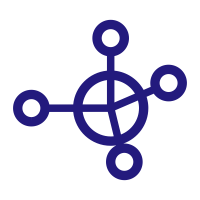 Manage the authentication of your Internet of Things (IoT) devices and Hook BounCA to your deployment system to generate client and server certificates on the fly. BounCA is open source. It's hosted, developed, and maintained on GitHub. 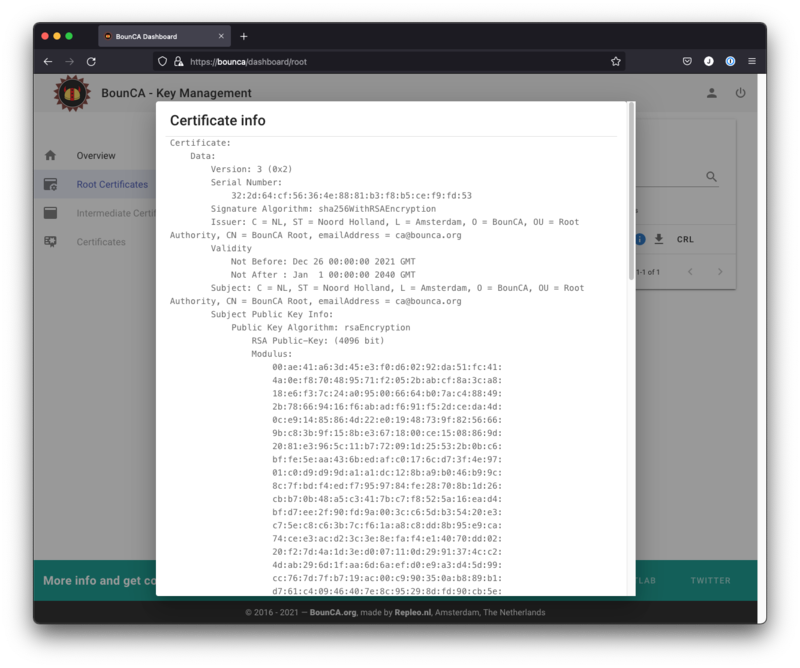 Download BounCA and Create your Root Certificate, create one or more Intermediate Certificates and create server and client certificates. Start now and visit the install pages. Code licensed Apache 2.0, docs CC BY 4.0. Last updated on Jun 29, 2016.